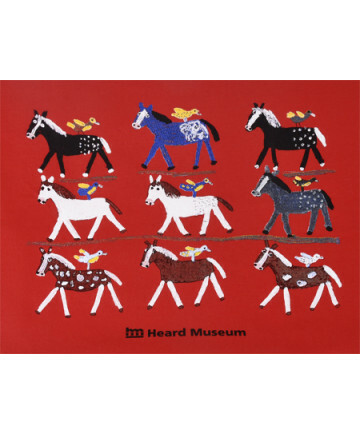 Heard Museum Folk art ponies t-shirt in size SMALL- designed by the late Mamie Deschillie (Navajo) Mamie Deschillie was born in 1920 in Burnham, New Mexico. She had no formal education after 2nd grade and helped her family by herding the sheep and goats. She also learned to weave as a child. 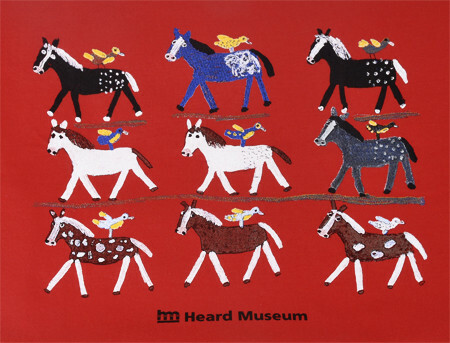 She did not start to make folk art until well after middle age, which has led some to refer to her as the Grandma Moses of Native American folk art. In the early 1980's a trader in Farmington, New Mexico named Jack Beasley asked Mamie to make something she remembered from childhood to trade. She brought in mud toys, handmade figures of mud and embellished with found objects that were dried in the sun and originally intended as play toys for children. The making of these types of toys had died out sometime in the 1940's. These objects launched her career. Later, she began working with cardboard and found objects to create her "cutouts". She cuts cardboard from old boxes into the shapes she wants then embellishes these figures with paper, paint, old clothing, fur, sequins, anything she finds that fits the piece. Her work is in the permanent collection of the Smithsonian's Renwick Gallery, the Heard Museum and the Wheelwright museum. Her work was also selected for exhibition in Lost and Found Traditions: Native American Art 1965- 1985 sponsored by the American Federation of the Arts. She passed away in November 2010. This richly colored 100% cotton t-shirt is pre-shrunk for an accurate fit. The image is silkcreened onto the fabric to provide years of wear. Tewa Tees is an American Indian Enterprise in Santa Fe, New Mexico.